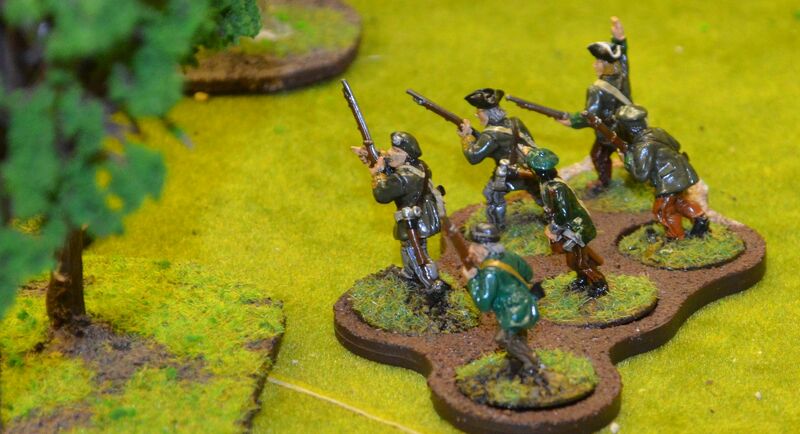 Back in October I had the pleasure of organising the 2014 Wargame event of the year known as BLAM. Three days of excellent games in my local pub. 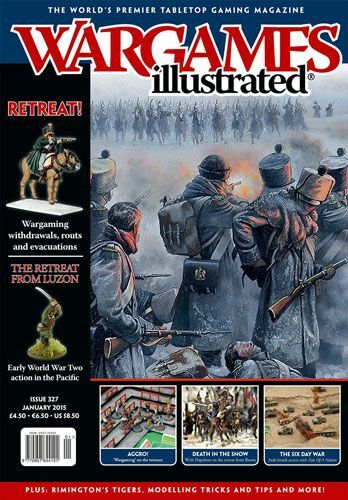 We were delighted to welcome Wayne Bollands from Wargames Illustrated to capture the event and sure enough this month sees a short write up of the event in WI327. Hope you all had a great Xmas ! 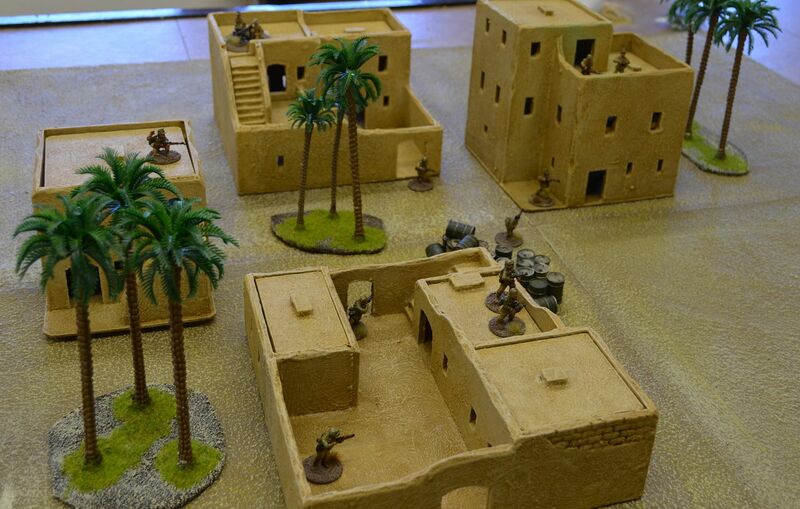 If you have been following my recent posts you will know that I have been building a desert landscape for Pulp, WW2 and Crusader adventures. For Christmas I was delighted to receive four buildings to kickstart my Desert town. These were all sourced from the Colonial Steamboat Company. Great products and great service. Once Christmas has been paid for I'll be ordering a few more of these. 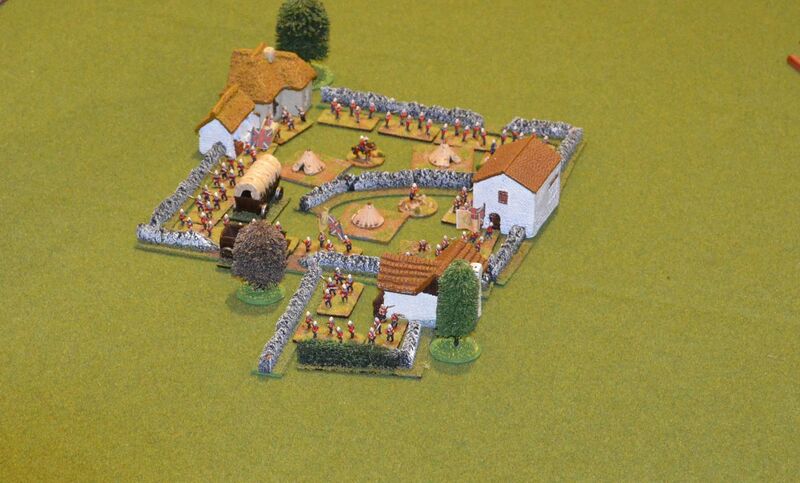 You will note from the website that they do both 15mm and 28mm products. 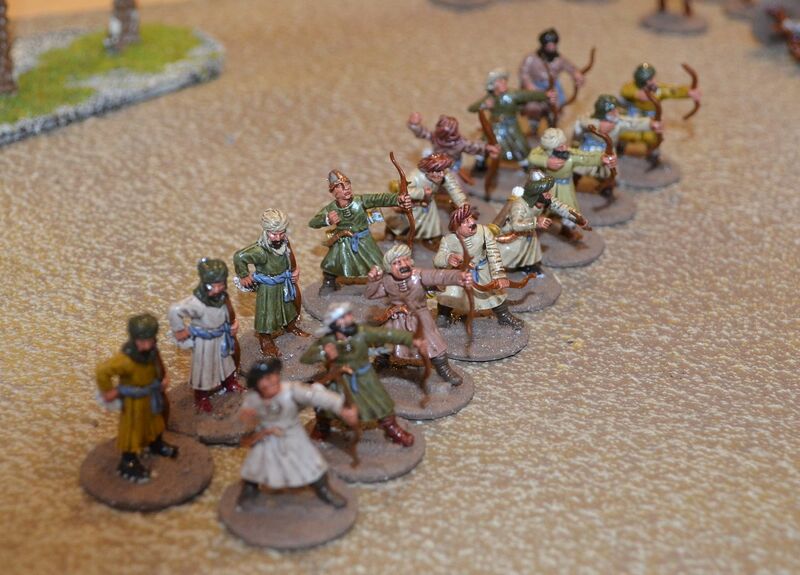 The figures are all 28mm Afrika Korps but the setting works for a number of genres. The Colonial Steamboat Company produce a vast array of these buildings. They are made from foamcore and card, but look very robust. All the roofs lift off. In addition to these I picked up a couple of aquarium rock sets off ebay for a fiver and painted these up in the same colours as the desert boards. I think they have come out rather well as additional terrain pieces. Up next on the workbench are some small plants and bushes to create more ground level interest. 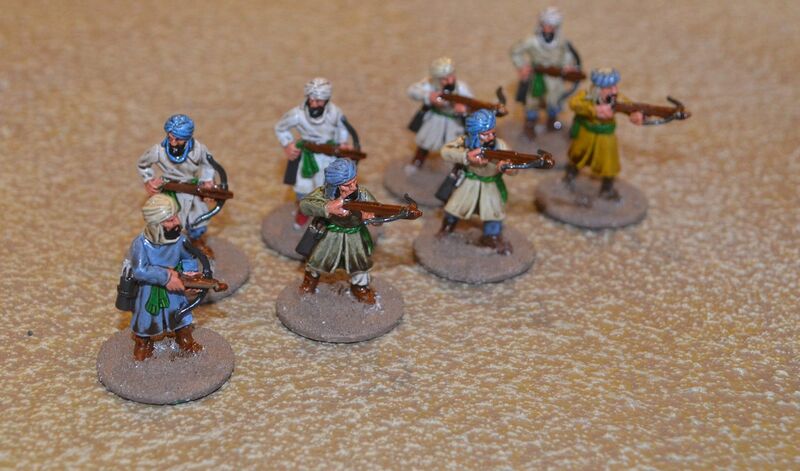 On the painting table I have just finished off another 40 Arabs with 40 more to go. Its Monday night - its bloody cold and I have three of the boys coming over. Well with temperatures hovering around zero I decamped from the shed into the kitchen and set up a rather small Zulu game. We played two missions the first being titled 'In the shadow of the mountain' the second called 'defending the mission'. As you can guess from the title these try to recreate the carnage of Isandlwhana and the heroic defence of Rourkes Drift. 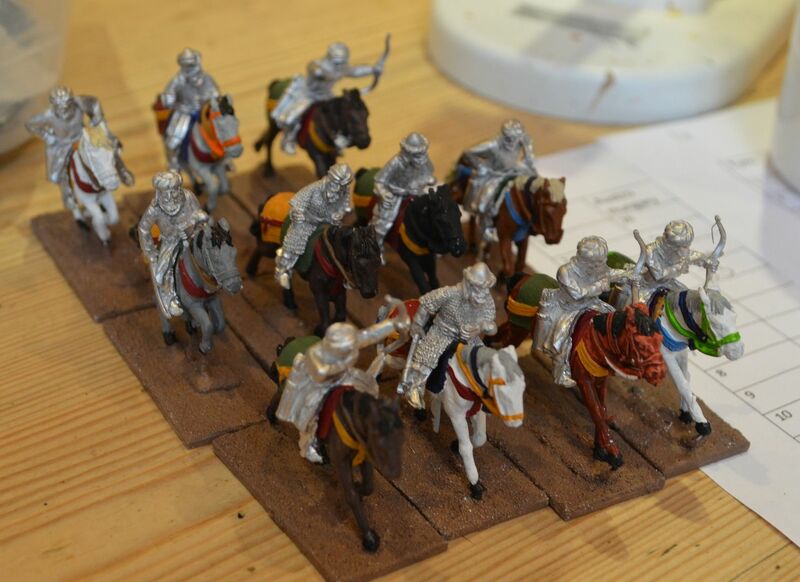 The scale is 10mm with figures principally from Magister Militum and Pendragon. I painted all these up about four years ago. We used a rule set I initially found on a freeshare site called the Restless Natives. These have been tweaked and now rebadged as 'Assegai'. The games have that uncanny ability of recreating those movies we love whilst at the same time are fast paced, unpredictable and very gory. If you interested in getting my own set in pdf format drop me a pm on one of the forums. Onto the battles...not too many pictures or AAR as for once I was playing...badly ! 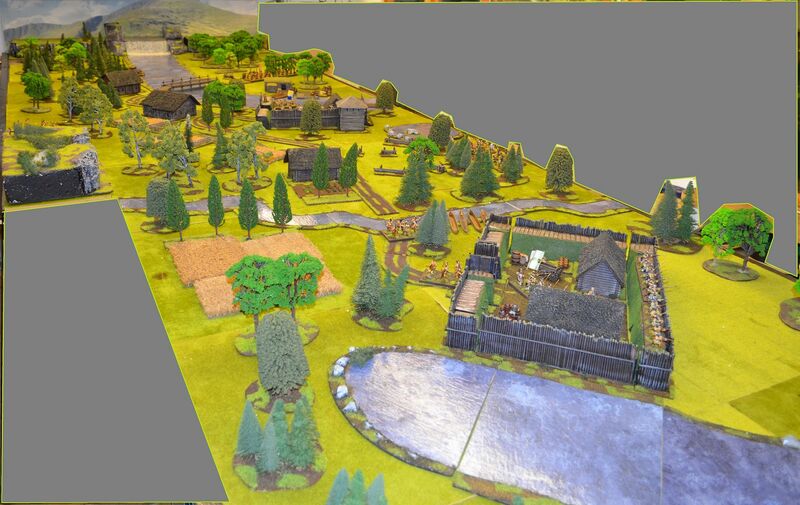 Well Isandlwhana went down to the wire but in the end the natives rushed the boys in redcoats and a massacre occurred. Could the defenders of the drift do better in game 2. At this point in time I clicked play on the stereo and out boomed the intro music to Zulu, the brilliant score by John Barry. 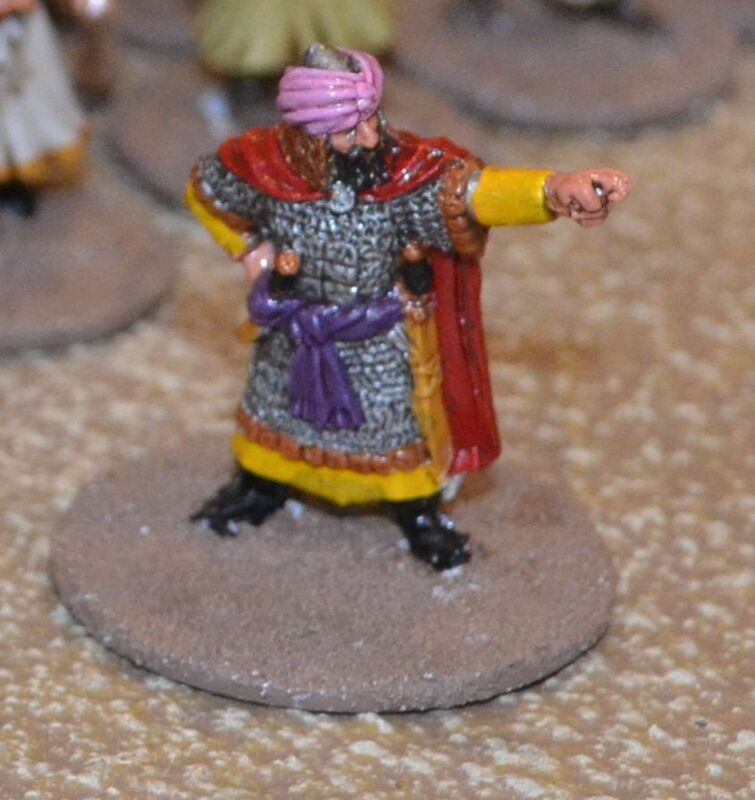 A couple of weeks ago I started painting my Saracen Army proper. I've painted up most of the horses but put these to one side and focussed on the 130 infantry figures already based and primed. 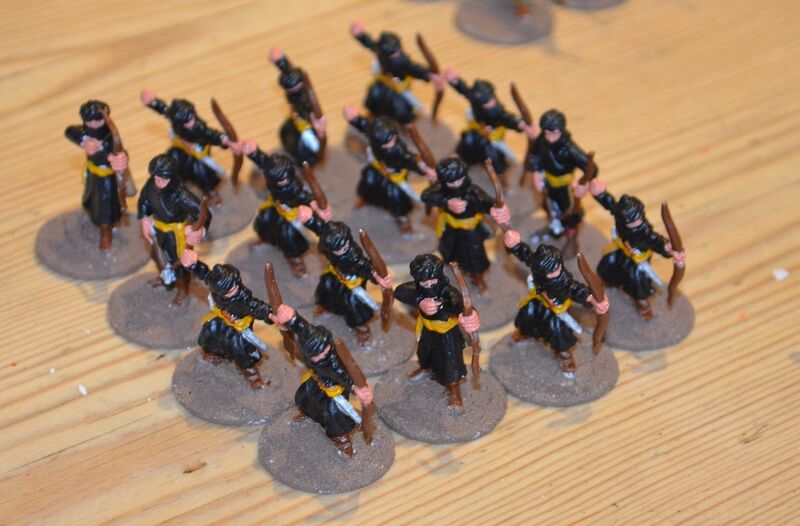 10 days later I can report 130 infantry figures painted. There are some provisos...firstly I have not painted the shields (toying with the transfer option) and secondly the basing still needs to be finished. You'll see that my painting style is very basic, slap on the colour and paint over with army dip (medium tone). This allows me to field armies really quickly and do what I like best play with my shiny toys. I haven't decided yet on whether I might tone down the shininess with a matt spray? 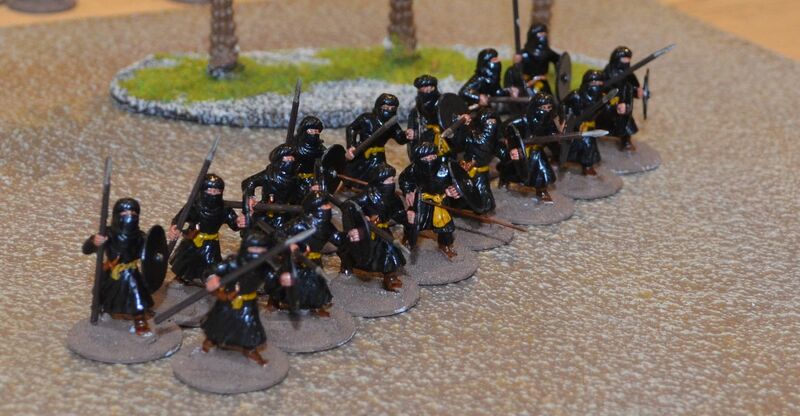 Again please bear in mind I am building a 'Hollywood' Saracen Army so no reference to historical inaccuracies please. 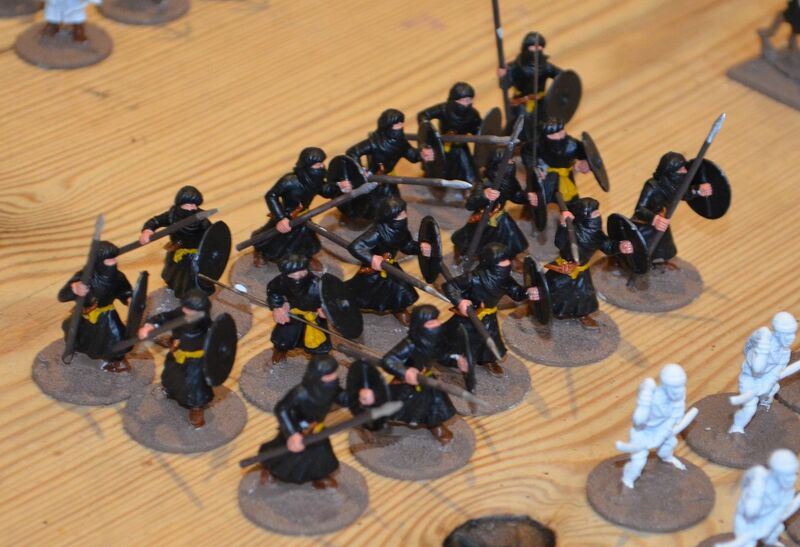 This lot were really easy to paint...all black. The bulk have come from Gripping Beasts Plastic Arabs. Sixteen Spears, Sixteen Archers and an Officer. 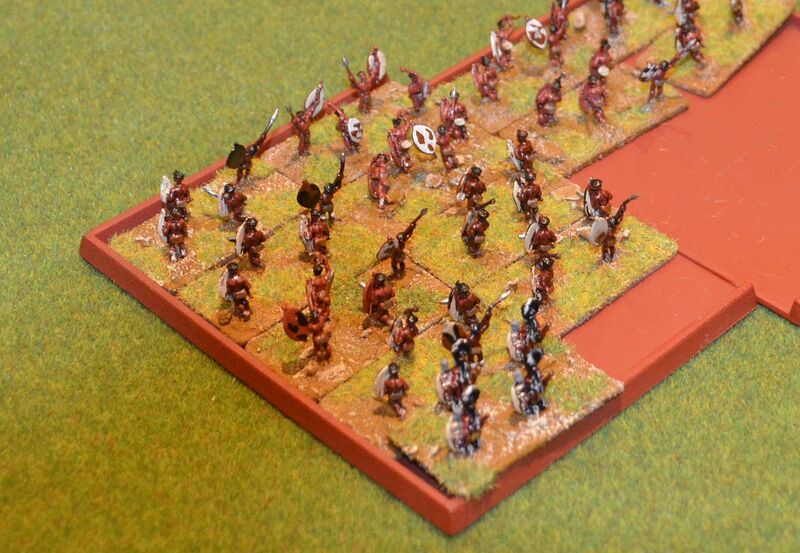 All my units will be built in eights to allow easy conversion to Saga. Next up is a neat little unit of Crossbows (all Black Tree Design). 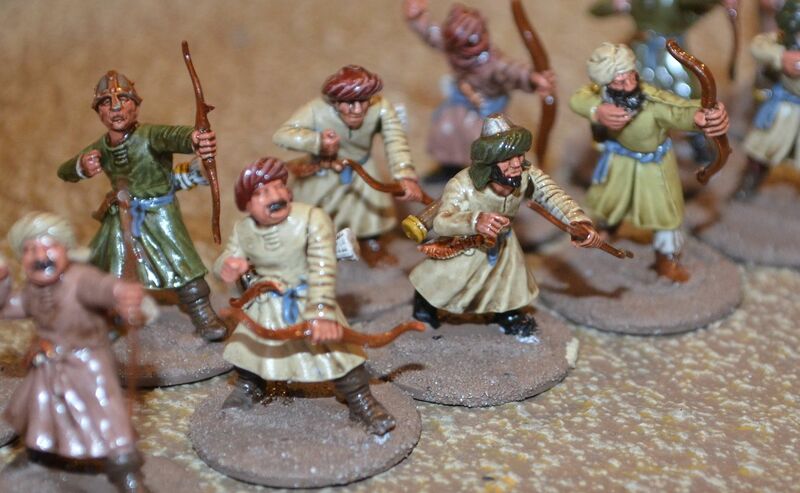 I will be building another 16 crossbows from the next box of Gripping Beast Arabs. 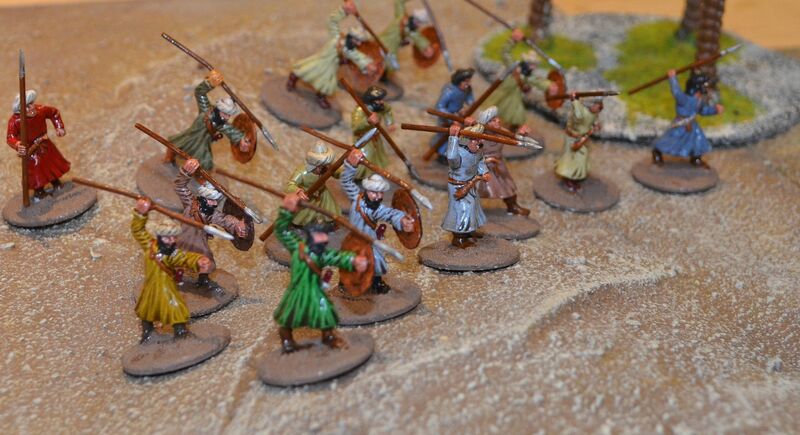 Archers are clearly something you need in a Saracen army so 16 so far. A mix of gripping beast and black tree. These guys all have blue sashes helping to tie the unit together. 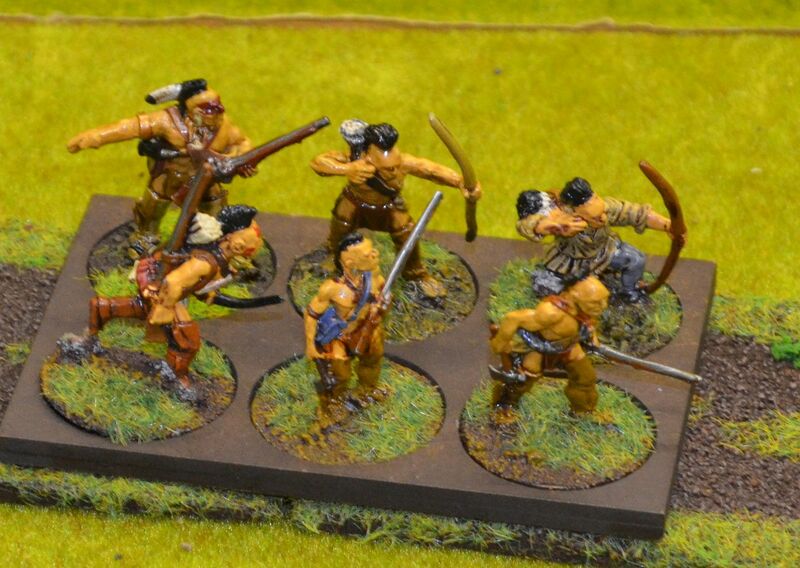 Next up are probably some of the nicest Black Tree figures - there spear armed warriors. Red being the theme for 24 of them. These will look great once the shields are added and the bases done. Finally I had around 24 sword armed and other melee weapon figures. 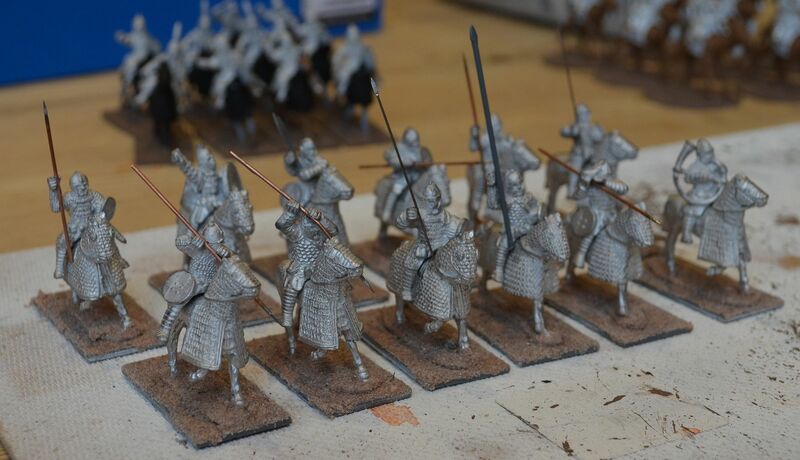 These could be dismounted knights, guards etc. Some of them would also look great supporting a Sinbad style game...there is a thought. 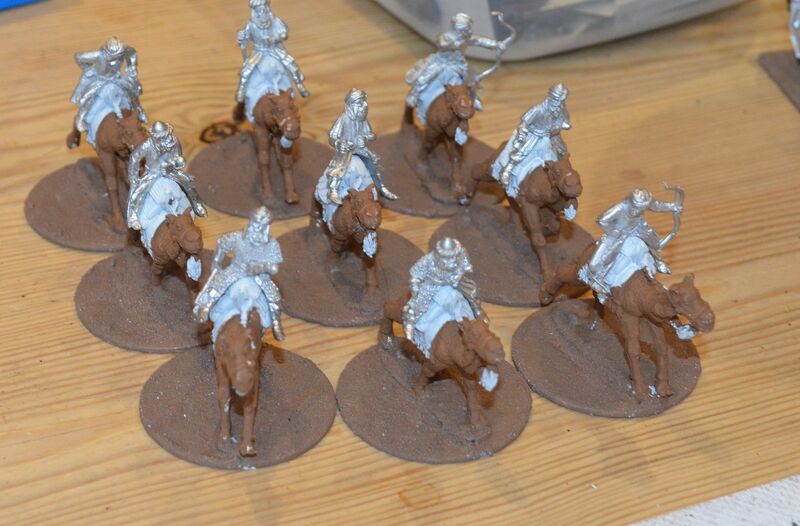 Up next - well there are another 80 infantry to be built md painted But I'll start next on the Heavy Cavalry. Shed Wars - Happy Third Birthday!! Its that time of the year when I am delighted to announce the Shed Wars birthday. Its three years old today and wow its been a momentous year ! In this post I'll share some of the highlights of the year, what was achieved and what is planned for year 4. However before I start I'll kick off with some Statistics. So my follower count has grown by over 100 and I have more than doubled the number of page views. In 2013 I was chuffed to bits just to reach 10,000 hits in a month. I am now regularly averaging 11-12k per month. The peak was 16,000 just after Salute. In 2013 I managed to post 98 times (almost an average of two per week), this year I have pushed a little harder and will probably top 110 by Christmas. Posting any more regularly is going to be tough and I think I have struck the right balance. A quick look through the posts suggests that there is a slight bias to terrain builds with battle reports coming a close second. Indeed I posted up around 18 of these in the year and I reckon the shed has hosted at least 30 games (I don't always put up reports). If you aren't aware I have set up a post called the Shed Wars terrain directory. This can be found on the top right hand side of the blog. I have archived all my terrain builds here and update this every so often. So the ambition for the next 12 months is to go past 400k hits and drive that follower number up to 400 and hit post number 400. Best call it the 400 target. So on the gaming front its been a great year with loads of different genres witnessing the tabletop, from the Arctic to the Hot Jungles, from a ruined city to a Very British port town. The Shed has also been delighted to welcome a group of local players and Monday nights go from strength to strength. This year alone over a dozen different players have crossed the threshold and lived to tell the tale. Back in the summer I permanently extended the table to nearly 16feet giving us loads more scope for BIG games. The plan for 2015 might even include an extension to the shed. 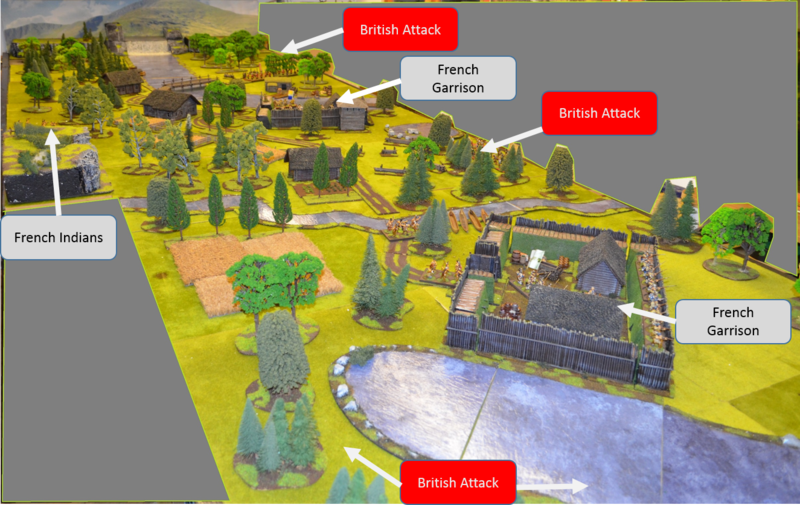 Perhaps the biggest project started in January of this year was the venture into the VBCW genre (Very British Civil War). 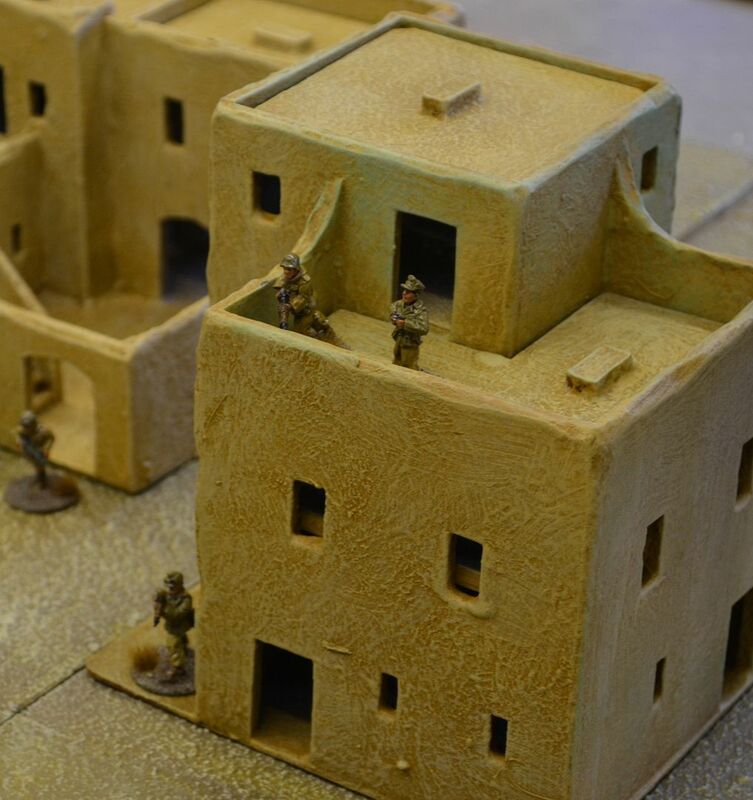 This has allowed me to develop an array of new terrain (including 1/48 scale dolls houses) and paint up over 350 28mm figures across the protagonists. The period has now branched out into WW2 where I could reuse much of what was produced for 1930's Britain in a WW2 environment. 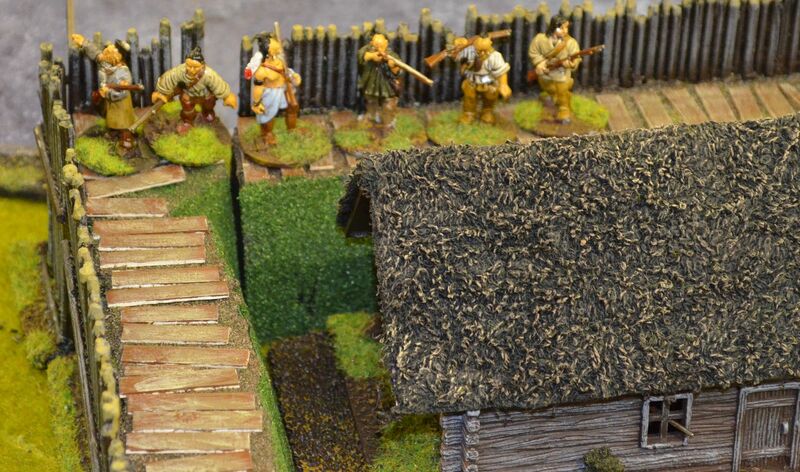 If you are looking for a fun period for skirmishes this is it...the boys on the VBCW forum are always looking for new recruits. Hard to believe that this started off as an idea in December 2013. 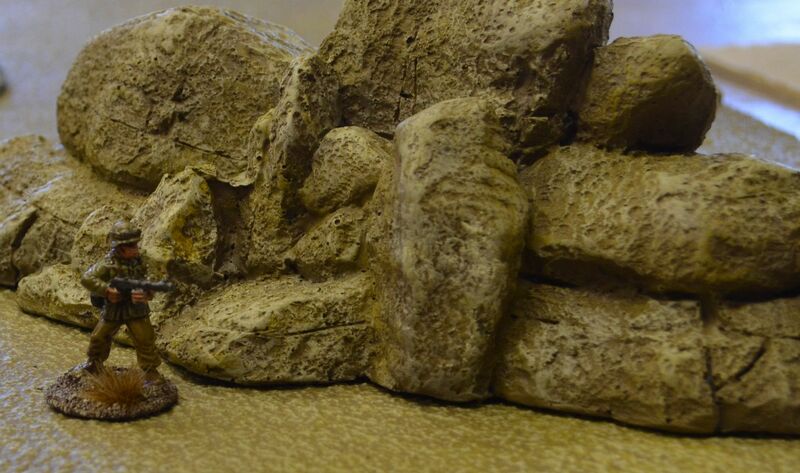 The other big project this year was the desert build complete with tombs, oasis, temple and pyramid. 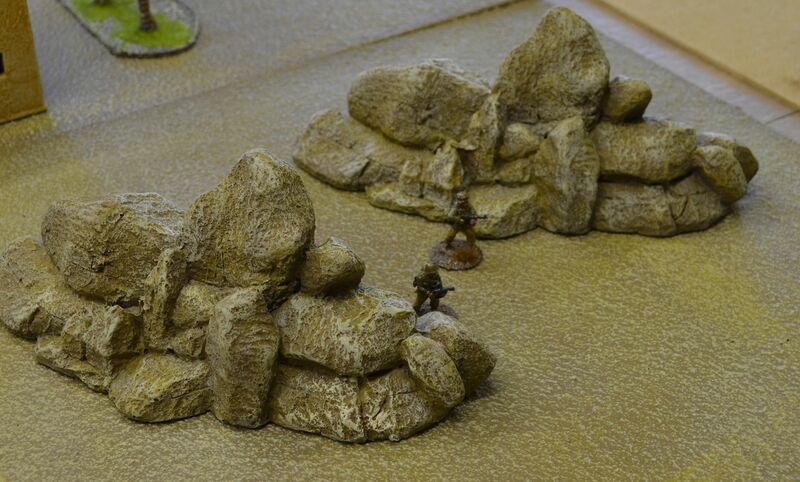 To date I think these are some of the best terrain pieces I have built. I just need to crack on and get the figures painted. 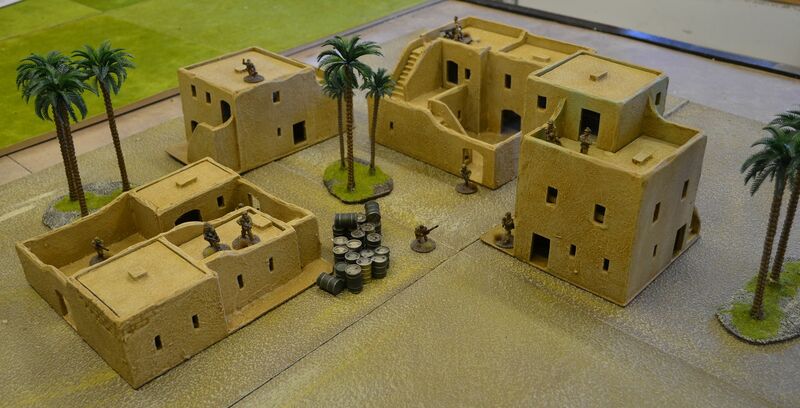 So in 2015 you are going to see 28mm Crusaders (Crescent & Cross and Hail Caesar rules), Indiana Jones using Pulp alley, and I decided last week that I was going back to 10mm with the Colonial wars of Sudan. I think thousands of fuzzie wuzzies might be fun. 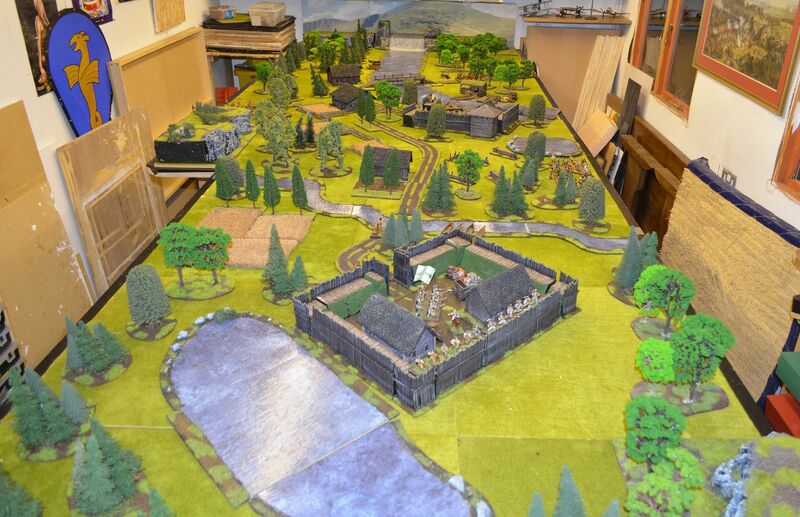 Another highlight of the year has to be BLAM (the British wargames weekend run for members of the LAF). Held in my local pub, 25 gamers from across Europe played across three days a massive array of games. For some strange reason folks were so happy with the venue and my organisational skills I have been asked to do it all again next year. 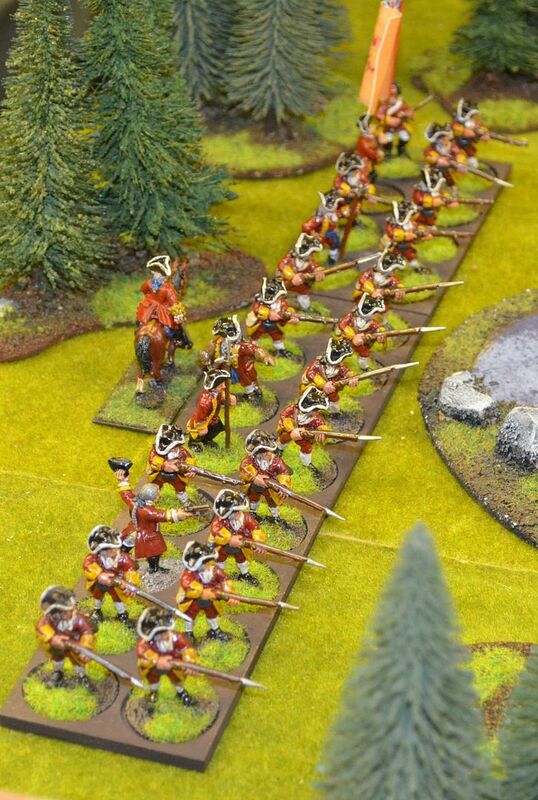 So 2014 has been a massive year for my Wargaming hobby, record numbers on the blog, projects completed, hundreds of figures painted and many a show visited. This was the year when I increased significantly the number of gamers I knew in my area and this was the year when I got a mention in the Wargaming press ! Before I sign off with my plans for 2015 many folks ask how much this hobby costs me and many have asked where I get the time? Addressing the first question - this year the cost of pursuing this hobby has been virtually zero. At the beginning of 2014 I cleared out a load of old terrain and figure that was never going to see the light of day. Ebay made a few quid out of me as at one point the paypal account was running into four figures ! Secondly I have deliberately sought out bargains on ebay and sold these on. I clearly won't articulate my strategy but suffice to say that this approach has netted me about £500 so far this year after costs. Finally I have decided never to buy what I don't need, what I won't use and where possible always go for the discounted option. Time - how much time do I spend on the hobby - probably more than I should but...but I hardly watch TV, I only need six hours of sleep per night, my teenage kids only need me for cash and lifts and my wife is a workaholic. I changed jobs back in August of this year so as things pick up with more travel its probable that 2015 might not see as great an input. Once again thank you for following this blog over the last 12 months, its been fun. Now that I am coming towards a good point in my arid landscape build I thought it would be appropriate to start building my Saracen army. I have a plan to use this for both Saga Crescent & Cross as well as a big ruleset game - currently looking at Hail Caesar. 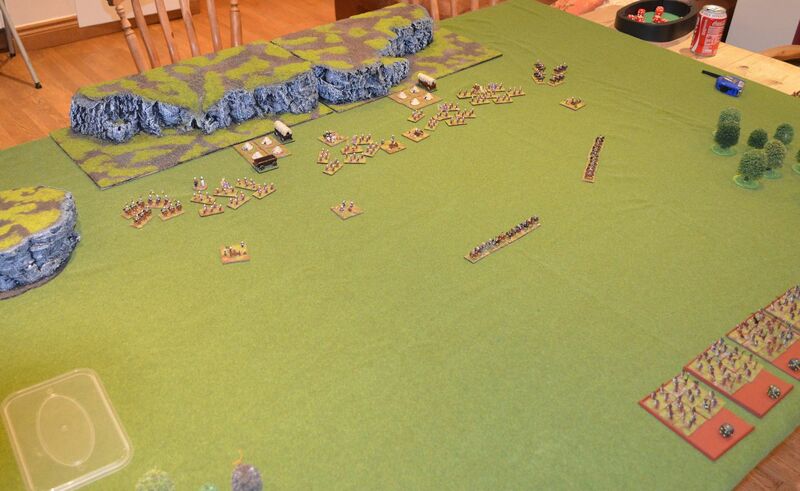 Fortunately I was invited around to a local friend earlier this week to play a LOTR game which had a cast array of forces on the table. This gave me the opportunity to count up the size of the potential force I want to deploy. So at present my plan is to field in excess of 200 infantry figures (of which a third will be archers/missile troops) and approx. 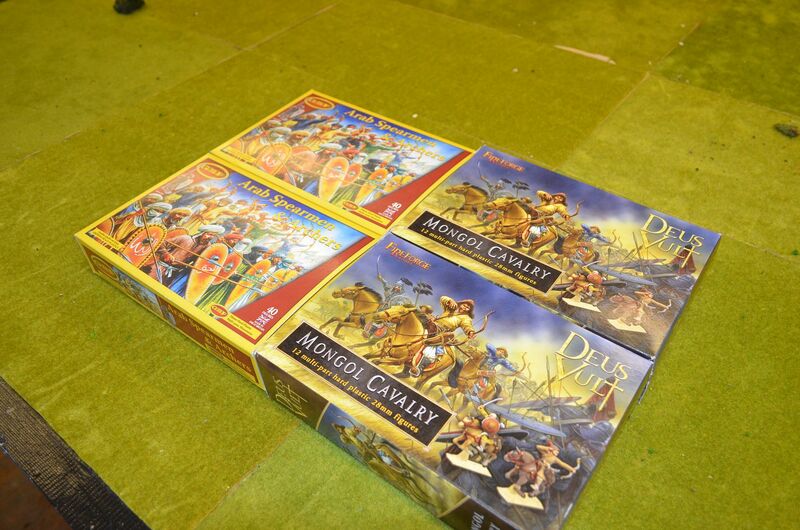 100 cavalry units (inc Camels). This will be by far the biggest army project I have yet tackled and the painting just leaves me in a cold sweat. Now I realise that a great deal of folks might think me blasphemous to say this but I am not developing one specific Islamic force but rather a hotch potch of folks in flowing robes and turbans that could work across the Crusade period. 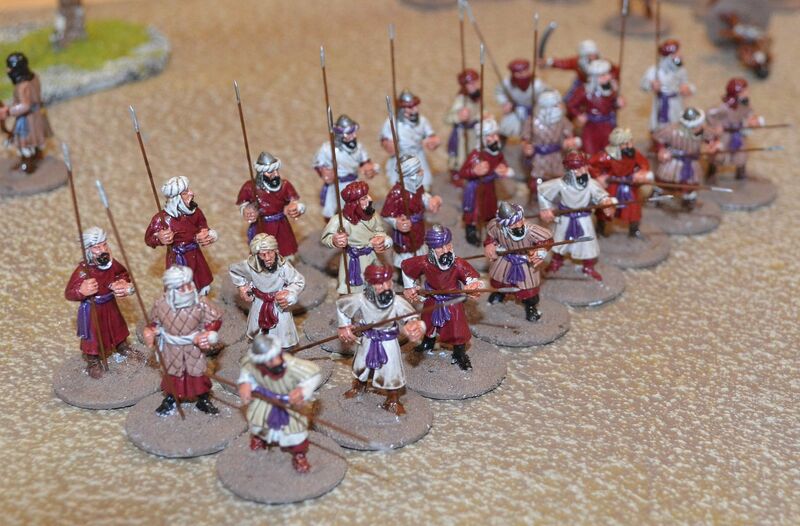 In the same way I mix up my Vikings and Saxons (lets face it they all used round shields, axes, swords and spears) I shall do the same with my 'Hollywood style' Saracen Army. In this first post Ill highlight the forces I have purchased and show the progress of painting so far. As I push forward on journey I'll be posting up regular updates. 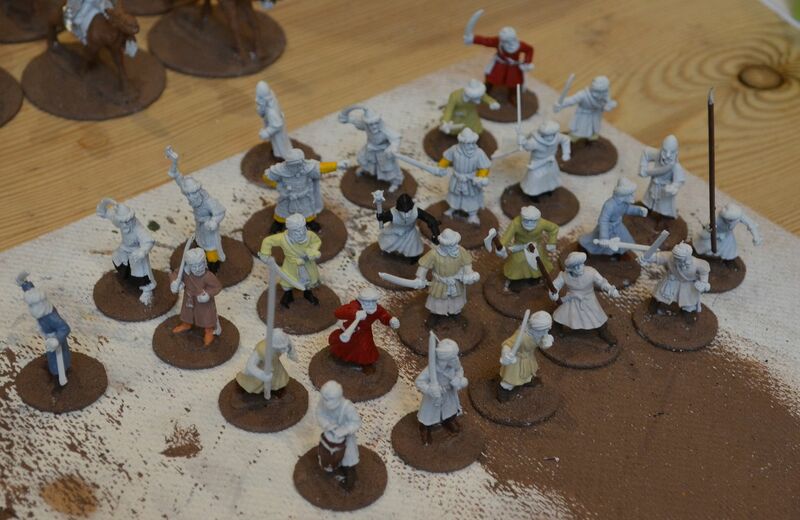 My ambition is to get the whole force painted by the time spring 2015 arrives. Clearly to build such a force is not going to come cheap so where possible I'll scour ebay for bargains, make compromises on sizing (if its advertised as 28mm it can go into the army) and take advantage of deals. 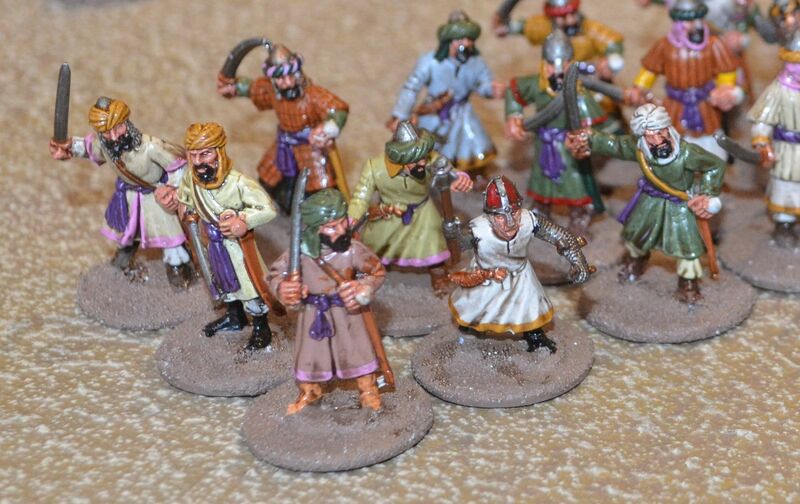 First up were three boxes of gripping beast's Arab infantry. 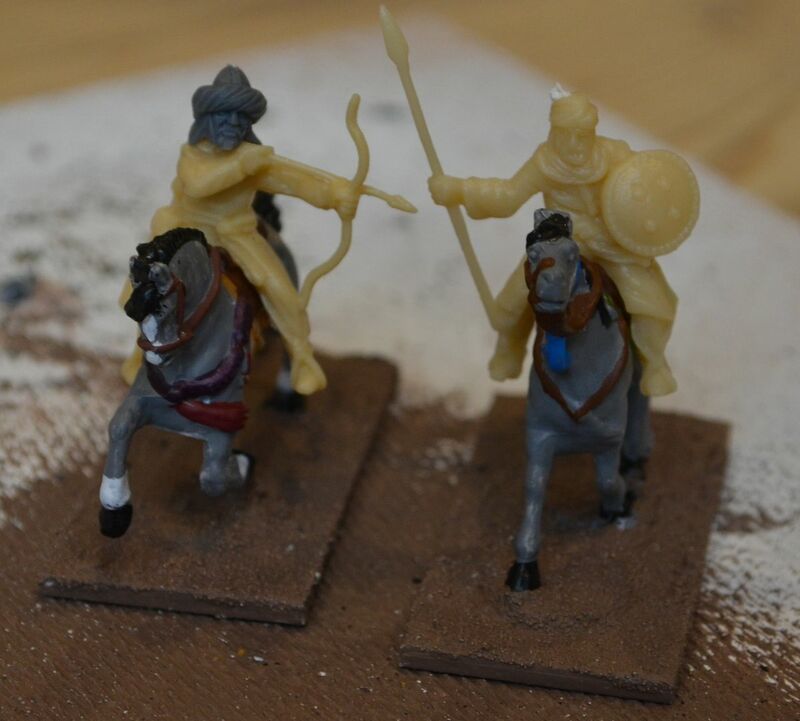 Its a real shame that this company don't do cavalry to match.I managed to put one of these boxes together in an evening and have embellished the force with a couple of long lances from an old fire forge set to make some standard bearers. - 16 are clearly of African descent so will make up a small skirmish unit of 16. I then managed to see one of those great Black Tree Design offers and I picked up a significant part of my force on one of their half price deals. If you have never checked out Black Tree do so and register your details, this way you can get advantage of some of their great deals. 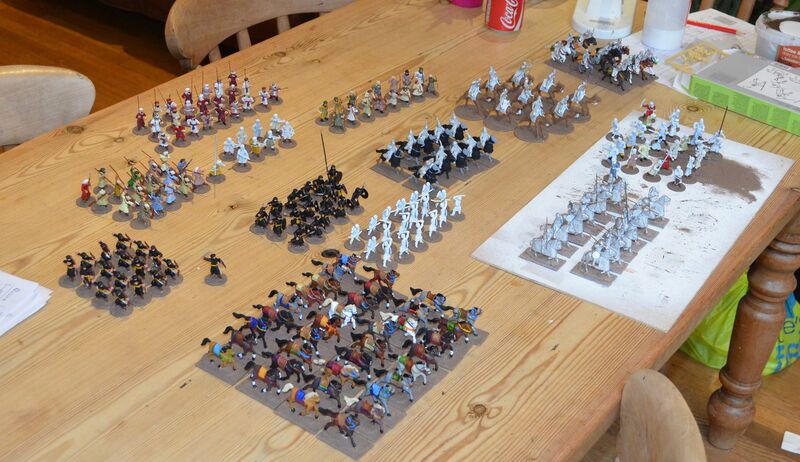 For the princely sum of about £100 I acquired 64 foot, 9 cavalry and 9 camel mounted troops. At the moment these all fit well together in scale terms. the Andalusian light, and the Almomaravid Heavies and Lights. 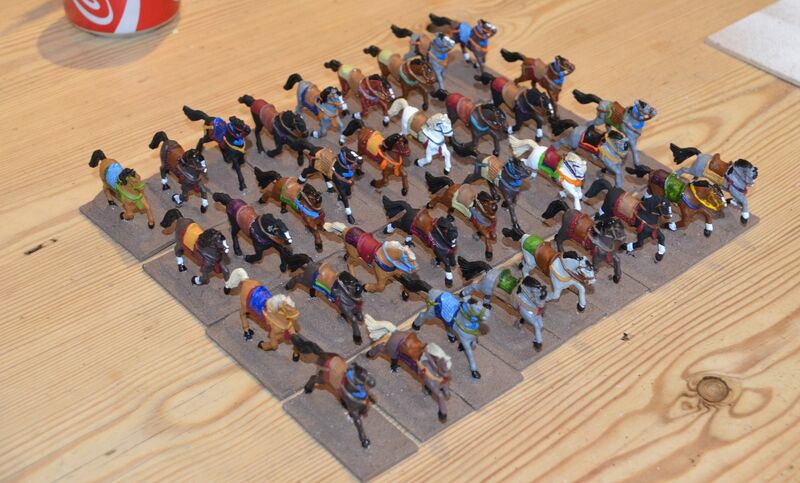 At around £12 (including postage) a box these cavalry figures work out at about £1 each. Damn....these figures are somewhat smaller than the black tree cavalry but what particulary grates are this size of the HaT heads...they are too small. 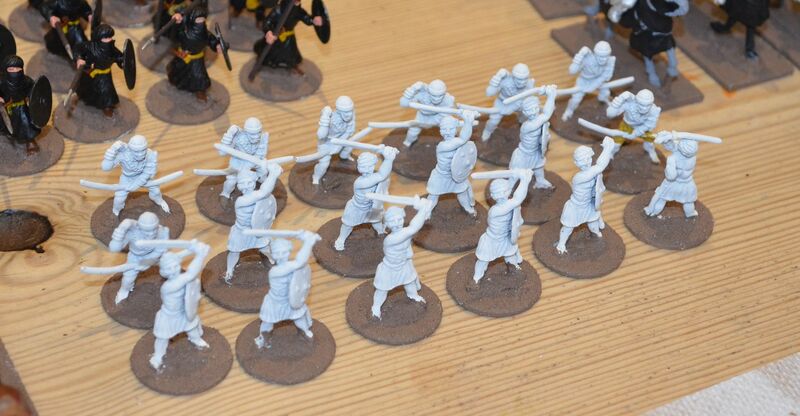 The problem was soon solved by using the spare heads from my first acquisition, the Arab Spearmen from Gripping beast. A quick snip and off comes the HaT head and ongoes a gripping beast version. They now look much better. The horses are still a bit small but once massed together this should not be too much of an issue. 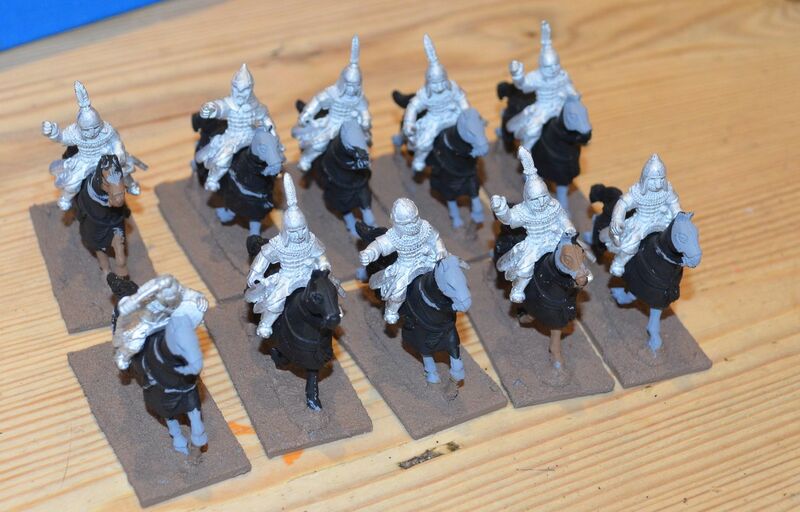 Up next were a unit of 12 heavy cavalry bought from a good chap on the LAF for £20 followed shortly by another heavy unit of cataphracts for a similar sum. 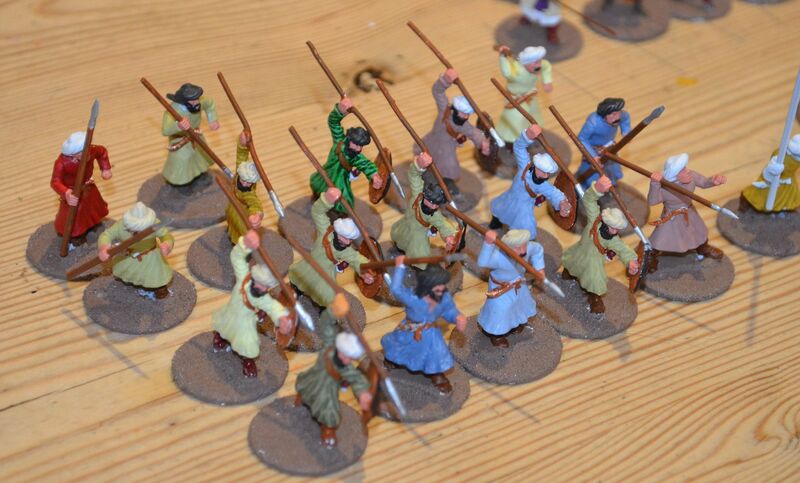 PLEASE NOTE that the figures only have their base coats on at the moment, no shading, touch ups etc. Shields and banners all to be added. 7. Black Tree Design Camels - Great Value !! By the time I have added all the fireforge mongols and the two boxes of arabs we will be getting close to the size of army needed..